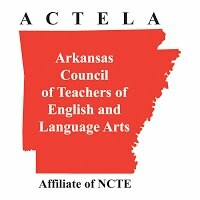 The Arkansas Council of Teachers of English and Language Arts (ACTELA) is a nonprofit organization whose aim is the improvement of the teaching and learning of English and language arts in the state of Arkansas. We provide a variety of services to teachers in our state, including participating in local events and conferences, offering mini-grants for teacher-led projects, recognizing outstanding language arts teachers throughout the state, and producing the yearly Arkansas Anthology. ACTELA is made up of ELA teachers from across the state. The organization is led by the members of the executive board. ACTELA is an affiliate of NCTE - the National Council for Teachers of English. NCTE"s mission statement is "The Council promotes the development of literacy, the use of language to construct personal and public worlds and to achieve full participation in society, through the learning and teaching of English and the related arts and sciences of language." For more information about NCTE, including how to join, visit NCTE's website at ncte.org. For decades, ACTELA has been supporting English and Language Arts teachers in the state of Arkansas. ACTELA is an award-winning NCTE affiliate. Past awards include: NCTE Affiliate of Excellence (2014 & 2016), NCTE Teacher of the Dream Grant Award (2015 & 2016), NCTE Affiliate Newsletter of Excellence Award (2017), NCTE Affiliate Website of Excellence Award (2017), and Kent D. Williamson Membership Award (2017).